The new technology of nuclear nonproliferation: The challenge is to prevent nuclear energy countries from becoming nuclear weapon states. Meet the Michigan Engineer who walked away from a six-figure career to help farmers and create jobs, building Haiti’s first bean-to-bar chocolate operation in her hometown. 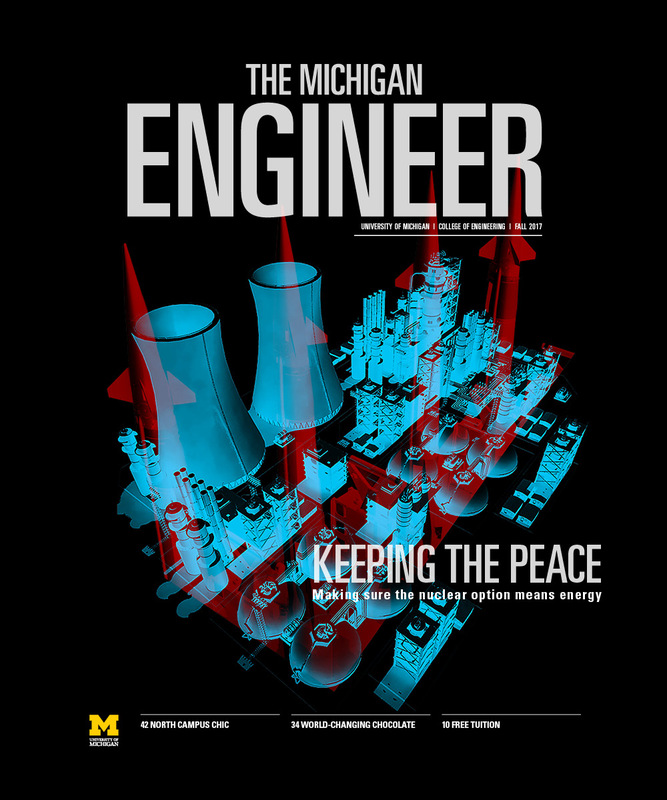 Before “geek” was “cool,” Michigan Engineers still found time for fact-finding, fashion – and fun. Engineering undergrads try out the Eda U. Gerstacker Grove’s new sand volleyball courts—with a robot. Anish Tuteja describes his new “superhydrophobic” coating as amazingly waterproof and ridiculously durable. The self-healing, waterproof coating could be available to consumers as soon as this year. Carlos Cesnik will be director of a new $8.25 million joint Airbus-Michigan center at U-M that will explore what it will mean to fly with flexible wings. Dawn Tilbury now leads the National Science Foundation’s Directorate for Engineering. She retains her U-M appointment and plans to return to the faculty in four years, when her term is completed. A new Tech Hub, funded by $7.75 million from NSF, will put tools to rapidly advance our understanding of the brain into the hands of neuroscientists. gerprinting" technique to study misshapen proteins believed to play a role in Alzheimer's and Parkinson's. Laura Murphy graduated in the spring with a bachelor's degree in mechanical engineering, and is co-founder of Adapt Design. In her last semester as a student, she wrote this opinion piece, published in the Michigan Daily. Fundamental engineering principles give this all-mechanical surgical instrument the dexterity of a robot at a fraction of the cost. The now-closed Ulrich’s bookstore on South University. Ann Arbor is emerging as a major player in the world of autonomous vehicles with the Mcity test facility, a one-of-a-kind simulated urban and suburban environment. Naturally evolving collaborations and adept leaders combine to forge early breakthroughs. The first African-American Michigan engineering graduate established a sturdy reputation for designs that last. With the Ford Nuclear Reactor being built on North Campus, the hope was that this conference would help to advance the cause of nuclear medicine and power. Harnessing the early internet and bringing real-time weather to our daily lives. What’s better than one Michigan Engineer making critical innovations at the Food and Drug Administration? How about two? Cass Technical High School students inch closer to the FIRST Robotics Competition and STEM-field careers at the Michigan Engineering Zone (MEZ) facility in Detroit.